This Marinated Steak Tip recipe is delicious with the subtle flavor of bourbon marinated throughout the steak tips. Combine bourbon, sparking cider, or sparkling grape juice, mustard, Worcestershire, salt, and pepper in a dish mixing well. Place steak in container with lid and cover with marinade mixture. Let meat marinate at room temperature for about 30 minutes. 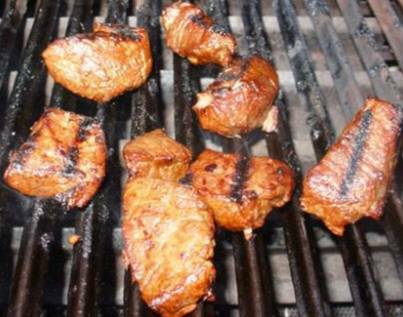 Typically steaks can be marinated for as little 2 hours or as much as 24 hours. Once steak has marinated to your desired timeframe, start your grill bringing it to medium high heat. Grill steak for 5 to 6 minutes per side for medium rare and remove to a cutting board to rest for 10 to 15 minutes. Cut steaks into 1-1/2 to 2 inch cubes slicing against the grain of the meat. This Marinated Steak Tip dish is excellent with Caesar salad, oven rolls, garlic mashed potatoes, asparagus and creamed spinach.